Cloudy start to the day, which accounted for the warm night. The day quickly cleared, become quite warm by lunch time – probably about 23 degrees. Some of the clothing layers have definitely been removed and thoughts of swapping the wardrobe around are starting to emerge. The sandals were also dug out from the back of the shoe cupboard! The journey to Erldunda was relatively short, less than three hours travelling time from Marla. The countryside was similar to the previous day, although a slight change in the wildlife Today we saw six horses, lots of eagles, crows and a flock of red-tailed black cockatoos. We also crossed the border into the Northern Territory. The caravan park at Erldunda is behind the roadhouse – a nice park with grassy sites but only bore water. Thank goodness are tanks are nearly full (my turn to have a shower tomorrow!). The roadhouse is very much different to the normal roadhouses in that is doesn’t stock supplies for the traveller, only souvenirs and takeaways for tourists. 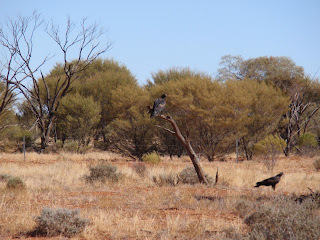 Fortunately, there is an IGA supermarket at Yulara. We sat around this afternoon attempting to catch up on some reading but spending most of the time chasing flies (Aeroguard seems to be well liked by all the local flies!). This evening we joined a couple from Adelaide for happy hour – so much nicer in warm weather, and the flies weren’t as bad. While we were socialising, a kangaroo hopped into the park for a feed, closely followed by an emu. 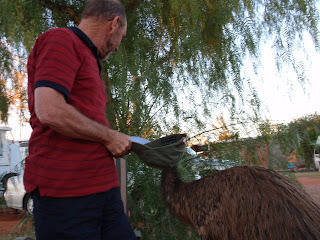 The emu had a good wander around before taking a liking to Les, who didn’t really take a liking to the emu!!! The highlight of the day was probably a telephone call from Jack, although it did take him a while to actually overcome his telephone shyness and talk.